From Aug 24 - Sept 21, 2007 Mike and I joined Alan and Jan on a biking and hiking adventure in Scotland. We rode though some of the Western Isles and Highlands. Sigh -- the trip is over. We are back at home. I wish we were still out there riding! Overall, Scotland was an excellent place to cycle. The country has lots of great back roads, as well as a good biking network -- especially the long distance routes like NCR #7. 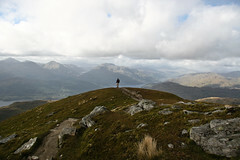 The hiking (hill walking as the Scots call it) is truly exceptional. Not the same deep wilderness experience that you can get in the Canadian back country, but lots of high and exposed ridge-walks with the most stunning views. Scotland is also home to some very interesting geology, and this is evident in even the mildest of hill walks. The people of Scotland are one of the greatest things about visiting the country. Everyone we met was helpful, pleasant, and very proud of their country. Sure, we were doing the tourist thing, so many of the people we met were geared up for us. But, we spoke with a lot of people who weren't in the tourist industry -- all the folks in Glasgow who gave us ideas about where to stay, people who stopped to pass the time of day on the side of a mountain, locals who started up conversations with us in pubs -- all great ambassadors for Scotland. 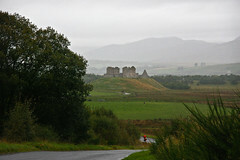 The weather is the only thing that might give someone pause when planning a biking/hiking trip to Scotland. It is not so much that it closed in and gave us a torrential drenching for days on end (Mike and I never had a full day of rain on this trip -- we did have days where we got wet, but there always seemed to be a dry spell sometime during each rainy day), rather that the weather changes very rapidly. So, you have to be ready with gear that works for you. Mike lost 15 lbs on this trip. Mary lost 10 lbs. Most expensive B&B was 65 pounds and the cheapest was 44. The average price was 50. Eating out in Scotland, even in pubs, can be very expensive. We found that the breakfasts at the B&Bs were so huge that we didn't need a big lunch, and/or dinner. We had a small camping stove with us, and a mess kit, so we bought a lot of our food at supermarkets. This really helped to keep the cost down and made sure that we got our veggies and fruits. Favourite local food product (other than the Lagavulin scotch and local beers) was the smoked cheddar cheese from the island of Arran. All in all, an excellent trip. I'm sure we'll get back for more riding in the north and A LOT more hill walking and hiking. We only "bagged" two Munroes (mtns over 3000 feet) -- there are lots more to try our hand at! Every post in the blog, and all of the picture sets have links to Google Map, with our route sketched out. Mike and I left Coille Mhor and rode down the Loch Lomond shore line to Drymen. The day was overcast with spots of rain. One thing you learn on a Scottish cycle ride is that the weather can change in a flash, so you have to be ready. We use Gortex for the rain -- jacket, pants, and boots. On the whole it works for us -- but some folks find it too warm. I would say that it is best, if you can, to test out your gear before a trip. From Drymen it was on to Balloch. This was our last view of Loch Lomond. This place must just hop in the summer time. It is so close to Glasgow, it must get packed. There was no one out on the day we passed through. From Balloch to Dumbarton we were on one of the earliest cycle paths in Scotland -- the Balloch to Glasgow route. It follows the banks of the River Leven. You can see that this place used to be full of factories. Now it has a few new housing developments, but it is mostly a lot of empty fields and old factory foundations. Dumbarton was a bit of a trick to get through, but we finally managed. Also, the route started to deteriorate -- glass on the path and a lot of garbage thrown around. Still, some interesting sights in the area -- the cliffs and castle outside of Dumbarton, the old canal between Dumbarton and Glasgow, the bike route through Bowling -- all worth a look. The route right outside of Glasgow runs along the Clyde. However, new construction and major roadwork made it difficult to follow the NCR #7 route. When we got into Glasgow proper we didn't have a city map, so we just started to ask people for ideas about places to stay. Within about an hour we had tried a few spots and settled on the Greek Thompson Hotel. It turned out to be centrally located for our explorations, and it had a good breakfast too. 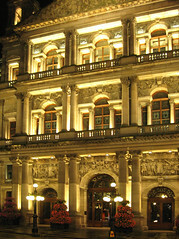 The evening of the 20th was our chance to take a look at down-town Glasgow. Very cosmopolitan -- we'll have to come back and explore some more. The 21st was our last morning in Scotland -- we did a quick tour of the big central park, and then took the bike route out to Paisley. We rolled through the countryside -- no problem with route finding -- and were in plenty of time to get the bikes brushed off and packed up. Good bye to Scotland -- we'll be back! Today was one of the best days of the whole trip -- we kind of did a Biking and Bagging (hiking) duathlon. We started the day with a hike up Conic Hill above Balmaha, then went back to the B&B, got on our bikes and rode about 10 km to Coille Mhor (our next B&B), then we hiked Ben Lomond. The Ben, as everyone in the area calls it, is a fine walk. We went up on the tourist track and came back on the Ptarmigan Ridge. The ridge walk towers over the east side of Loch Lomond and, when combined with the main route up, makes a nice full traverse of the area. Some guide books suggest that Ben Lomond is a bit overdone -- but if our hike was anything to go by, I would say it is well worth the time. The views are fantastic, there were only a few people on the mountain, and the trails are steep enough to be interesting. Earlier in the day we joined Jan and Alan for a hike up Conic Hill. This trail takes you right up the Highland fault and gives excellent views. It is a very interesting walk because you are right on the fault -- you see the Lowlands stretch out to the south and the Highlands rise above you. Like much of Scotland -- geology in action. I can't let this post go without saying how much we enjoyed our hosts on Loch Lomond -- last night with Betty at Passfoot, and now with Fiona at Coille Mhor. They really made our double-dipping mountain day a real success. Pictures from Conic Hill and Ben Lomond. Our hiking and biking routes in the area. We spent the evening of the 17th in the town of Pitlochry. I am sorry that I didn't get to see more of the town, because it really looked like a pleasant spot. The day started out wet, and after visiting the Co-op to stock up, we headed out on the small road to Loch Tummel. We decided to ride along the river Tummel and Loch Tummel, taking us down to the Fortingall Yew (oldest living thing in Europe). From here we headed into Kenmore, couldn't find a B&B, so rode along the south side of Loch Tay into Killin. This Loch Tummel - Loch Tay area has some stunning riding -- the south side of Loch Tay is beautiful, if a bit hilly, and Glengoulandie (south of Foss) makes for a fun ride too. Killin to Callander was an easy day on an abandoned railway grade. Fine views, quiet riding, a lunch stop in Strathyre at a hotel with floor to ceiling scotch bottles, and a good B&B in Callander made for a fine day of riding. Our hostess put out wine glasses and plates and we had a celebratory picnic dinner in the dining room. Alan and I became quite addicted to Callander slab -- a fudge/toffee candy made in the town. Alan was a hit with the salesgirl -- prompting her to say "I love you"! as we left the store. The 18th started off quite chilly, it threatened rain, but held off until later in the day. Once again it was off on quiet forest tracks around Loch Venachar and Loch Drunkie (hey -- I'm not making that one up). We rolled past highland cattle, mountains peaking out of the clouds, and views over the lochs. We came out of the hills down a steep hill into Aberfoyle. The rain started in Aberfoyle and was with us for the last part of the day. 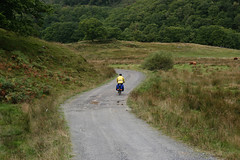 This was a ride up and over a high ridge and then down into the Loch Lomond area. Jan and Alan had a place booked at the town of Balmaha, on the shores of Loch Lomond. Mike and I wanted to head further up the Loch to Rowardennan, but the hostel was full. So, we decided to try our luck in Balmaha too. Our luck held and we ended the day with tea and cookies in front of a roaring fire at Passfoot B&B on the shores of Loch Lomond. Pictures from Loch Tay and the Trossachs. After making a circuit of the Culloden battlefield Mike and I joined up with the National Cycle Network's route #7. Since I am now writing this after the fact (a bit difficult to find public internet access in the Highlands) I can say that the the NCR #7 from Glasgow to Inverness, once out of the tangle around Glasgow, is really world class. It should be full of riders. From outside Culloden we stopped at the Clava Bronze Age burial cairns and standing stones (I still can't get over these standing stones -- they are fascinating). We had lovely views over Loch Moy and got a kick out of how everyone said the Slochd summit was so hard (NOT!). We took the off-road alternative along the Strathspey steam railroad line and came out in Aviemore. We ran into Jan and Alan in Aviemore and together we planned the next day of riding. We decided to ride down through Kingussie, Newtonmore, and Dalwhinnie to the Pass of Drumochter. What a day -- we picked up a 20 mph headwind out of Newtonmore that lasted all the way to the top of the pass. We made it up, but we had to pace-line -- and there was a lot of singing of show tunes too! When the show tunes come out, you know the going is hard. From the top of Drumochter it was down to Pitlochry. I was amazed that we had our own off-road, yet paved, bike route down from the top of the pass. Well done Sustrans! There was a lot of whooping and cheering as we roared down our own bike road. It was getting late in the day and the weather was in and out rain (although no wind, so I was very happy), so we hurried on to Pitlochry. I would have loved a bit more time in this area to check out the sights -- we'll have to come back! After hearing from Jan about all of the things on the Great Glen route, Mike and I decided to do the route too. We started off from Glen Nevis Youth Hostel and rode down to Inverlochy Castle, just outside Fort William. From here we got on the Great Glen Way. 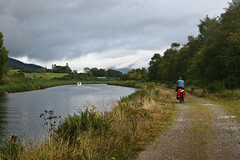 The Way goes from Fort William to Inverness and uses most of the Caledonian Canal. We started off with Neptune's Staircase, then rode along the north shore of Loch Lochy. At the end of Loch Lochy we ended up on the hiking path along the south side of Loch Oich. Then it was back on the canal into Fort Augustus. 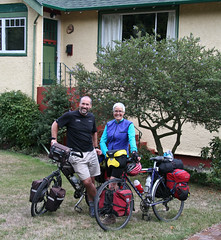 We ran into Jan and Alan in Fort Augustus and the next day we rode together up the south side of Loch Ness. After a steep hill out of Fort Augustus, we were on one of the old military roads from the 1700s. Lots of speedy downhill and flats -- fun riding all around. It was an easy ride into Inverness from the hills around Loch Ness. Mike and I went on through town to the Culloden area, while Jan and Alan stayed in Inverness. They wanted to spend a lot of time at the Culloden battlefield the next day, so we figured we would meet someplace on National Cycle Route #7 over the next few days. was a cloudy day and we spent part of the hike in the clouds. We had to use compass bearings to find our way coming back down. But it was a fine hike anyway, as we did get views about half-way down. We were thinking that our friends Dave Chesterman and Mark Weston would really like this little tramp! The real gem of the last few days was the bike ride over the last stretch of the West Highland Way. We loaded up the bikes and headed up Loch Leven from Glen Coe to Kinlochleven. This was rollercoaster of a ride -- great views of the mountains, glens, and lochs. The day was sunny and warm and the visibility was excellent. At Kinlochleven we had several kilometres of up, up, up -- to the Mamore Lodge, where we joined the Way. Then it was up and through a high, but rather flat pass -- mountains rising all above us, a few ruins in the middle of the pass. The day was really quite perfect. We passed a few walkers, and they all looked at us as if we were crazy. We did look quite a sight with our fully loaded bikes dodging potholes and rock, and fording streams. The West Highland Way day was Jan's birthday, so we had a b-day picnic for her in the middle of the trail -- Strongbow, chocolate, and presents. We were thinking that Lisa and John (especially John) and Mark Weston would really enjoy this route. We had to be up on our bike handling skills to get the most out of this day. The end of the Way gave us great views of Ben Nevis, and made Mike and I more determined than ever to climb it the next day. It is wild how quickly the weather changes here -- so beautiful and sunny one moment, then overcast and blowy the next. 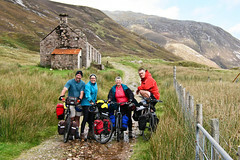 In Fort William, at the end of the Way, Jan and Alan opted for B&B while Mike and I hit the hostel. Jan and Alan will now be making their own way forward, as there are a number of things that they want to see, while Mike and I want to try and get in a bit more hiking if possible. We will probably meet up again somewhere on the route.